Or so Prime Minister Stephen Harper decreed on January 30th, flanked by Peter MacKay, Minister of Justice and Attorney General of Canada, Steven Blaney, Minister of Public Safety and Emergency Preparedness, and Julian Fantino, Associate Minister of National Defence, and the largest personal protective detail in the history of Canada. 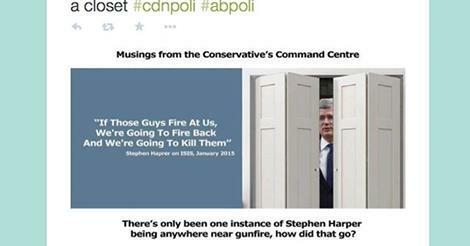 It would seem that Harper sees himself as a ‘war-time’ leader, who, in the run up to the next election, wants to project a manly, statesmanlike image. While cultivating a culture of fear, he is appealing to those who traditionally will cling to the political status quo in times of unrest. And in one swell foop, the man who spent the Ottawa siege in a closet ramped up the anxiety and fear of a nation, while simultaneously putting into place measures that many feel will result in further loss of civil liberties and reduction of freedoms. By no means am I minimalizing the two horrible attacks . They were horrific, and shocking to Canadians who rightfully believe themselves to be a part of the world’s peace keepers. But these attacks increasingly seem to have been the acts of self-radicalized, troubled and confused young men, with no evidence connecting them to ISIS. Harper’s proposal sounds less like a desire to protect the nation, and more like the fear mongering of a politician desperate to keep his seat in power. So much for his vaunted and pious defense of Canada’s Freedom of Expression and Freedom of Speech after the recent Charlie Hebdo attack in France. Our Freedoms were already considered under attack, based on his own government’s track record of secrecy, muzzling, sneaky omnibus bills, a disdain for democratic Parliamentary rules, and the misleading of Parliament. Ottawa Citizen reporter Ian MacLeod called the proposal “the most dramatic package of new laws since the Anti-terrorism Act of 2001.” But .. hang on … who flew into our towers? Three misguided fools in Canada took it upon themselves to mirror the acts of other misguided fools in the Middle East, whom we’ve done nothing but publicize in the media. The same media that attempts to inflame viewers by ramping up anxiety about events in other parts of the world in hopes of getting higher ratings, and very often has the issues completely wrong. 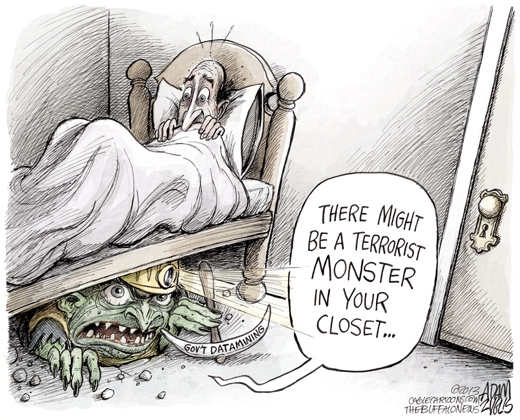 Ironically, terrorism is most effective when it’s target reacts disproportionately to fear. Perhaps those sweeping powers would be better used in policing how media is actually romanticizing terrorism, and making it seem glamorous to impressionable and disenfranchised people who believe they have no voice or impact upon their own democratic governments. There’s a huge difference between planned, organized and directed attacks (terrorism) and a misguided fool whipped up by web sites designed to muster support for a cause. 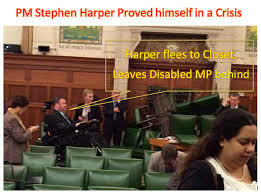 No matter how often the Conservatives tell us that the attacker of Ottawa’s Parliament was linked to a terrorist network, we’ve still not seen follow up information, or the RCMP background video we are told contains proof of such a link. It’s the politics of fear and terror. 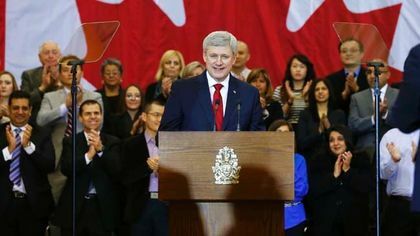 NDP leader Thomas Mulcair was right when he questioned why Harper is proposing new legislation with far reaching consequences without so much as consulting with opposition parties. 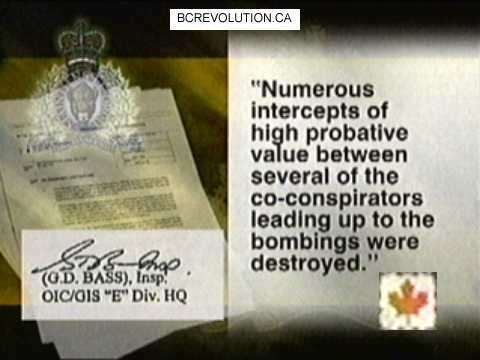 Canadian rights, already being pecked away by post-9/11 laws, look to be even more constrained under a granting of extraordinary power to Canada’s spy agency, the Canadian Security and Intelligence Service (CSIS), with a mandate to “investigate and disrupt” terrorist plots. Canada’s police services will be able to go after online terrorist propaganda. The line between being branded as an activist or a terrorist is already grey. With these proposals, that line could be even more abused than it currently is, and in fact, simply obliterated. 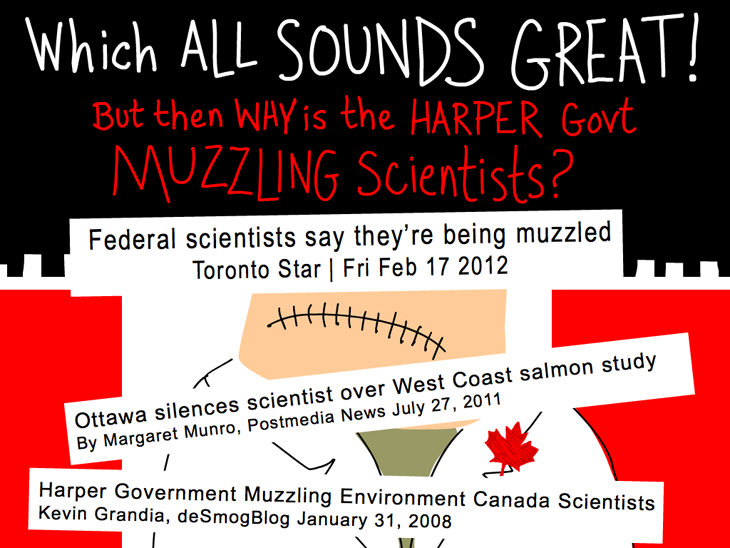 Could a government with a long list of enemies, including labour and environmental movements, simply capitalize upon already existing powers such as restricting the right to remain silent, laws allowing CSIS to spy on Canadians overseas, detainment without charges, and arrest without warrants? 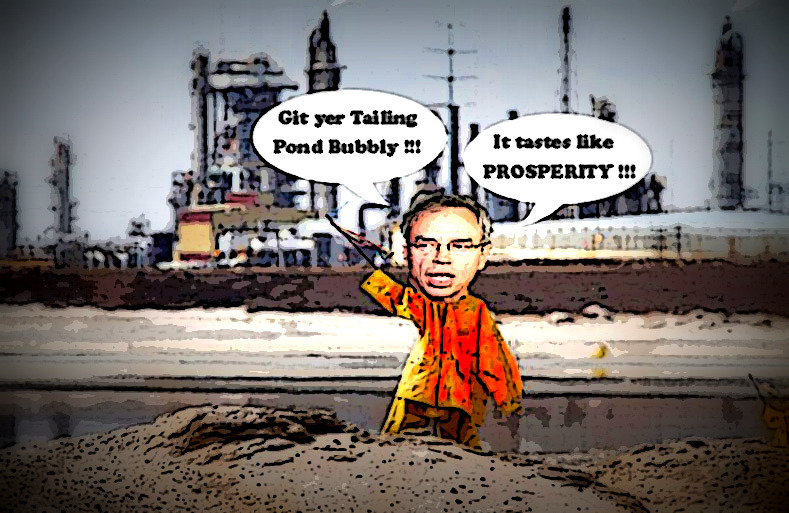 In 2012, Joe Oliver, then Minister of Natural Resources, wrote an open letter to Canadians on the government’s commitment to the diversification of energy resources (i.e. the Northern Gateway, Alberta’s Tar Sands.) In it, he said “environmental and other radical groups threaten to highjack our regulatory system to achieve their radical and ideological agenda.” He claimed that these ‘radicals’ were employing Ameri can tactics to “sue everyone and anyone to delay the project,” and that ‘slow, complex, and cumbersome regulatory processes’ were slowing down the government’s ability to push ahead their own unilateral decisions and agenda. Those ‘radical’ environmentalists were concerned about 50 square miles of tailing ponds full of toxic chemicals, supposedly lined but actually leaking at the rate of 3 million gallons per day. (Pembina Institute.) Cancer rates are 100 times the norm for the First Nations living on the Athabaska River. Over 80% of BC residents have said NO to oil tankers on their coast, and coastal First Nations have declared a ban under their traditional laws. Perhaps these are small concerns to Mr. Oliver, but they are of vital importance to those who actually live in the area. These ‘radical’ environmentalists could now potentially be charged with terrorism. Could there be a better time for the government to ramp up fear and politicize terror? When the Anti-terrorism Act of 2001 was due to expire, the Tories’ Combatting Terrorism Act of 2013 reinstated them, with yet more power, and this new legislation would continue to expand on an overbearing and intrusive presence by government controlled security forces , bringing us ever closer to becoming a surveillance state. On Sunday, President Barack Obama told CNN’s Fareed Zakaria that it’s important “we maintain a proper perspective,” on ISIS, and that they are not “an existential threat to the United States or the world order.” He added that the U.S. needs to see the threat for what it is and respond to it in a way that doesn’t undermine American values. “It means that we don’t approach this with a strategy of sending out occupying armies and playing whack-a-mole wherever a terrorist group appears, because that drains our economic strength and it puts enormous burdens on our military,” he said. Look – I get it. We’re all scared. 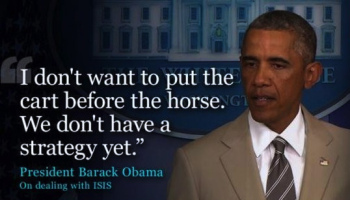 We’re afraid of ISIS and Ebola, of extreme weather and IEDs, of Monsanto and dirty bombs and oh my lawdy, what’s next! There’s too much crime, we’re told, and draconian systems of justice continue to be put into place at enormous cost, when in fact, crime rates are falling. While some American states legalize marijuana, those in opposition continue to pump out propaganda against pot, and institutionalizing people where the substance has not yet been legalized. The truth is, “we may be living in the most peaceable era in our species’ existence,” as Stephen Pinker concluded in his 2012 book The Better Angels of Human Nature: Why Violence Has Declined. 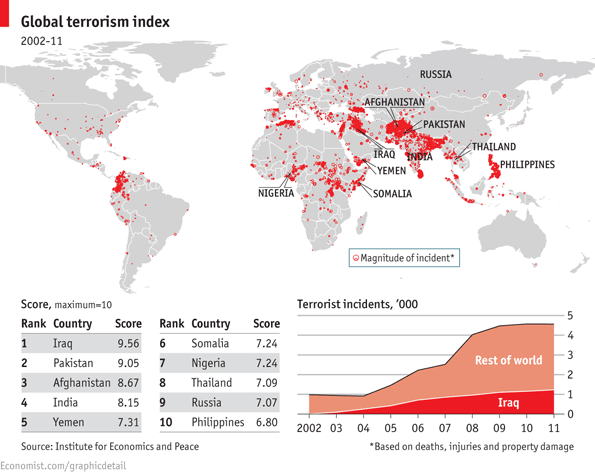 Terrorism peaked worldwide in the mid-1980s, and in North America around 1970. If you live in Canada or the United States your chances of being killed by terrorism are almost zero. We’ve been sold an exaggerated sense of danger about conflicts and events in other countries, which has allowed those in power to divide and conquer it’s people, alienate North America from war torn nations, engage in wars that profit only those in the military trade, and snip away at Canadians civil liberties, eroding our freedoms. There are those who will say, “What do I care? I’m not a terrorist! Go get the bad guys!” Those people should perhaps have a chat with the innocent citizens caught up in the police actions taken against the G-20 demonstrators in 2010. More than 20,000 police, military, and security personnel were involved in policing the protests, which at its largest numbered 10,000 protestors. 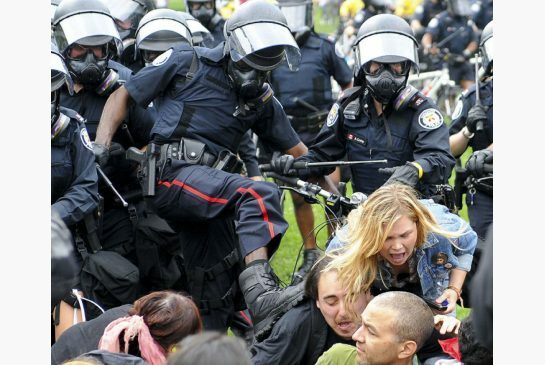 Over a thousand arrests were made, making it the largest mass arrest in Canadian history. There were no ‘innocent until proven guilty’ dispensations; in fact, Toronto Police and the Integrated Security Unit (ISU) of the summit were heavily criticized for brutality during the arrests. You cannot hermetically seal a democratic society to protect it from violence; doing so actually reduces democracy. 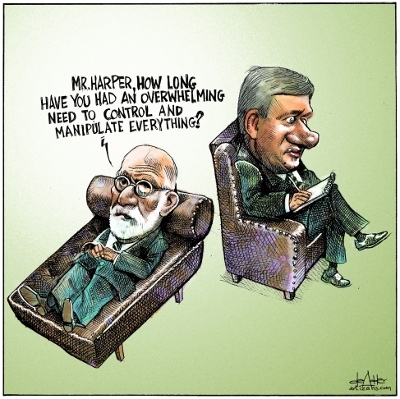 Despite the self-inflicted threat fear that Harper is trying to sell us, it’s our own government limiting our rights, not jihadists.